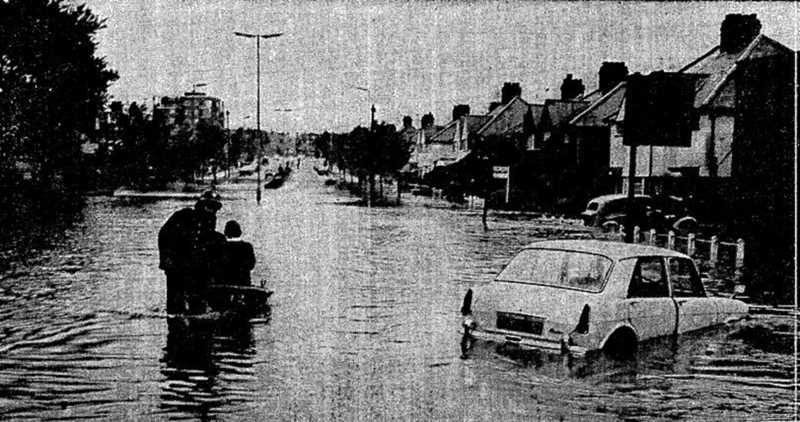 Mid-September sees the 50th anniversary of the 1968 floods in Lewisham caused by the Rivers Ravensbourne, Quaggy and Pool all overflowing their banks as a result of two days very heavy rain on 15 and 16 September 1968. 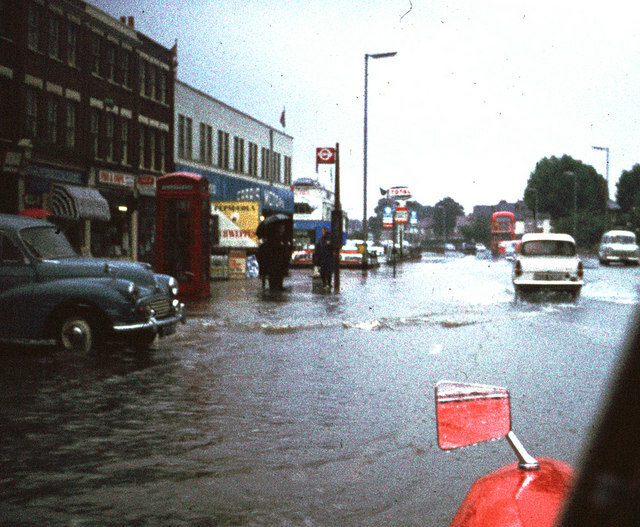 The summer of 1968 had been one of the wettest on record, so the ground was already pretty much saturated causing large amounts of water to immediately run-off with large amounts draining into the local rivers. So what caused the floods? A warm and very moist air front which had its origins in the western Mediterranean converged with a cool, moist one from the Baltic over south eastern England. The fronts then moved very little for two days. A broad area from the Thames Estuary to Hampshire received six weeks of rain, 75 mm (3” for you non-metric folk), during those two days. A large area including south east London received double this – 150 mm (6”) – 3 months of rain in 48 hours. 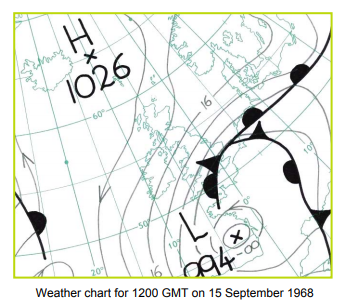 On Sunday 15 September alone, the Met Office noted that Bromley saw the heaviest rain with 129.5 mm (5.2”); rain in Bromley ends up in flowing down the Ravensbourne and Quaggy to Lewisham. With this volume of rainfall it is not surprising that drainage systems failed to cope. To understand the sheer scale of the flooding it is worth noting that the Quaggy, which typically had a depth of 15 cm (3”) at one point was over 5 metres deep in Lewisham (1). Traffic was unable to run at all along the main road between Catford and Loampit Hill as the entire area, built in the Ravensbourne flood plain was flooded (2). 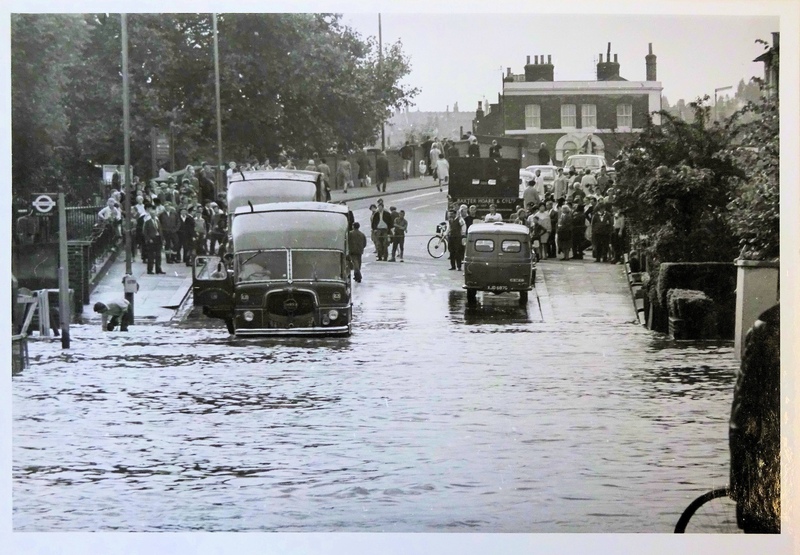 The Ravensbourne runs in a fairly flat valley all the way through Catford and Lewisham and there was flooding all the way along course – The Times photographed flooding on Southend Lane, close to Bromley Road where the usually hidden Ravensbourne crosses (3). There was flooding too further upstream at Bromley South where the Ravensbourne burst its banks. There were lots of memories on Facebook threads on this of using boats from Peter Pan’s Pond – originally a mill pond on the Ravensbourne (now the pond outside Homebase) to row around the area, including getting into the bar at the Tiger’s Head and generally playing in the flooded waters. 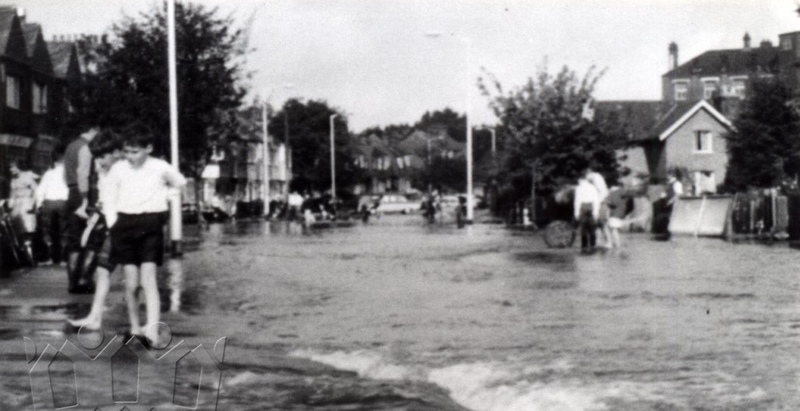 In nearby Watermead Road, flood waters reached 1.5 metres deep in places (as they did on Southend Lane) – houses there took a year to dry out and there was some looting after the flood waters receded. A little further downstream is one of iconic pictures of the Lewisham floods – the Robertson’s Jam Factory which had the Ravensbourne immediately behind (on a Creative Commons via David Wright on Geograph). Unsurprisingly, a hundred metres further down Bromley Road, there was also flooding at the junction with Aitken Road (on a Creative Commons via David Wright on Geograph). Those with basement flats were particularly badly affected – in one on Barmeston Road the water went up to the ceiling. 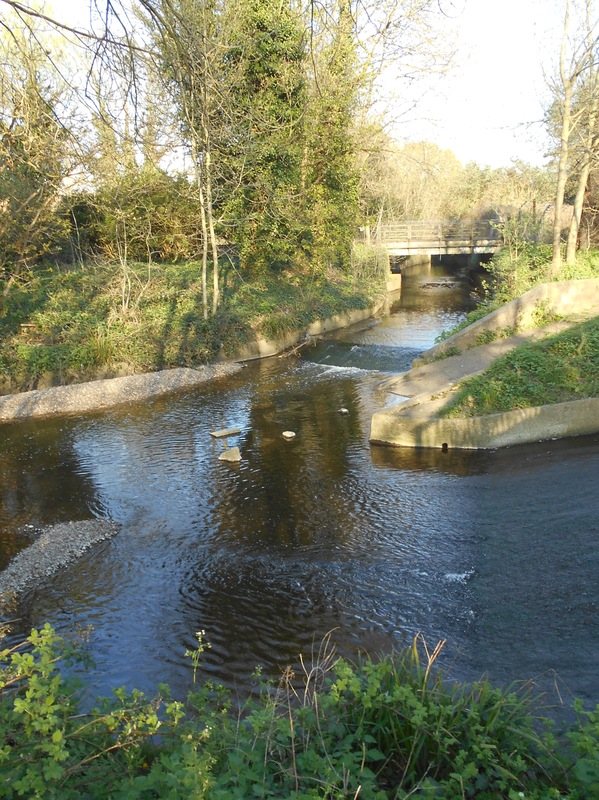 The volume of water coming down the Ravensbourne was augmented by the also flooded River Pool (see below) – the confluence is just south of Catford Bridge. This meant that Catford Town Centre was under water. There were memories on Facebook of free buses being laid on to transport people wanting to get from Stanstead Road to Brownhill Road, elsewhere refuse lorries did the same thing. There was a ‘not entirely successful’ attempt to sail from Catford to Lewisham on a wooden garage door brought downstream on the Ravensbourne. More appropriate forms of water transport were used in Ladywell Fields where an unknown kayaker paddled close to the railway bridge. While not shown in the picture there was a boat that ferried people across the worst of the flooding at Ladywell. 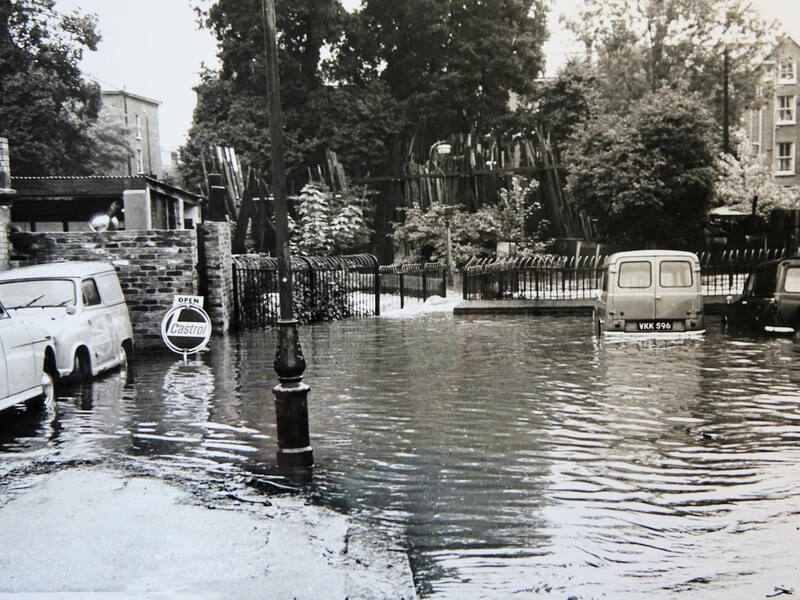 Marsala Road, parallel to the Ravensbourne, itself became ‘a fast flowing river’ with water levels inside houses rising to over a metre above ground level at one point. There were Facebook memories of playing on a tractor inner tube in the flood water on the street. The ground floors in neighbouring Elmira Street were flooded too. In Lewisham it seems that the flooding caused a crane to topple over – presumably on the Sundermead Estate that was being built at the time (4). From its entry into Lewisham at Chinbrook Meadows (and no doubt further upstream too) there was flooding along the Quaggy, Just outside the park in Marvels Lane, next to Sydenham Cottages as the Quaggy burst its banks. Lee Green flooded, although probably not as badly as it had done in the past from snow melt in the early 19th century. Manor Lane, where the Quaggy is bridged and Leahurst Road flooded too. There was flooding on Lee High Road and the parallel streets – with memories of submerged basements and flooded gardens around Eastdown Park – the photogrpah belwo shows the bottom of Dermody Road and the bridge over the Quaggy into Weardale Road. 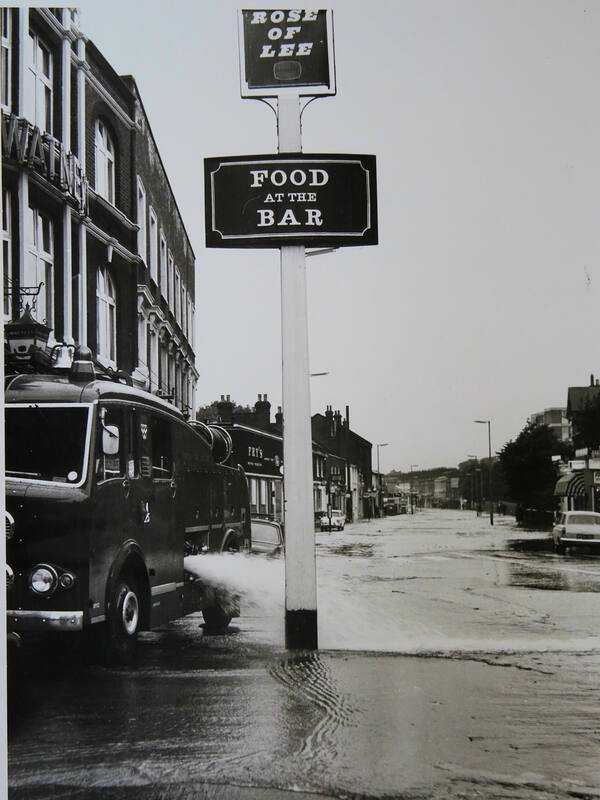 On Lee High road itself the shops on Manor Park Parade (opposite the Rose of Lee, now Dirty South) had almost 2 metres of water in their basements). At Lee Bridge water reached the top of the steps of the White Horse and there are rumours of paper money floating in the basement of the then Midland (now HSBC) Bank opposite, which were covered in a blog post on the last stretch of the Quaggy. The bottom of the High Street flooded as the whole area around the Quaggy and Ravensbourne confluence was inundated – perhaps the most icon photograph of the floods are of the ‘Lewisham Lake’, it made the front page of the Daily Mirror but local people put on their wellies just got on with life as the photograph below outside the Odeon (formerly Gaumont) shows. One of the largely culverted tributary streams of the Quaggy, Hither Green Ditch, seems to have flooded on Verdant Lane. 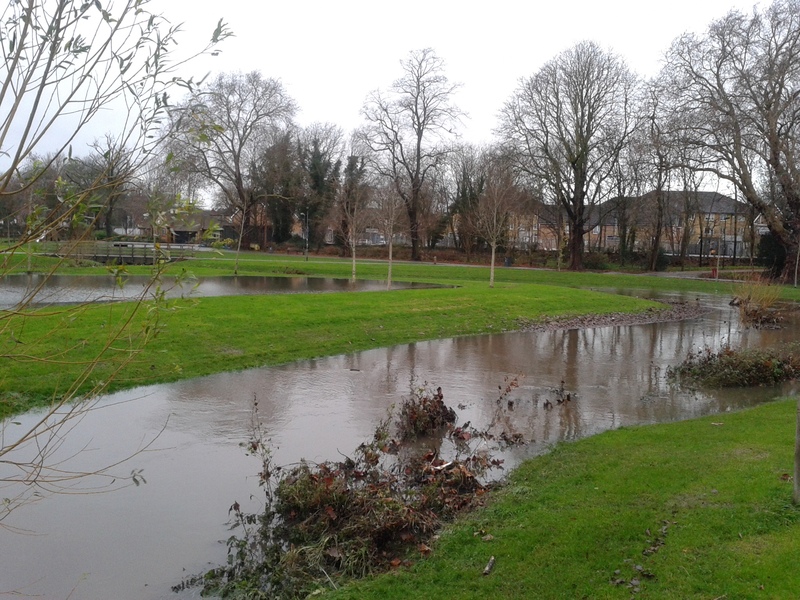 The Pool effectively forms in Cator Park in Beckenham from the confluence of The Beck, Chaffinch Brook (which certainly flooded) and the River Willmore (often known as Boundary Stream). Unsurprisingly, the River Pool flooded too at, and below, Bell Green. The photograph below is from Winsford Road, with the backdrop of Grangemill Road in Bellingham (on a Creative Commons via David Wright on Geograph) – the area flooded to the left is still open ground and known locally as Dog Field (after a very short-lived greyhound track that was once there). 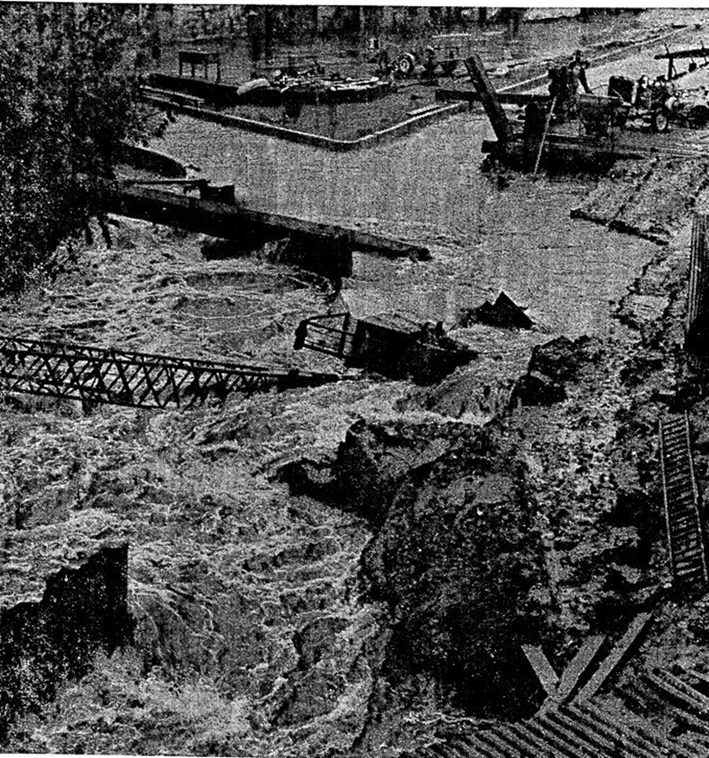 The high waters washed away large amounts of coke from the gas works, off screen right, which was deposited on the allotments behind Dog Field. 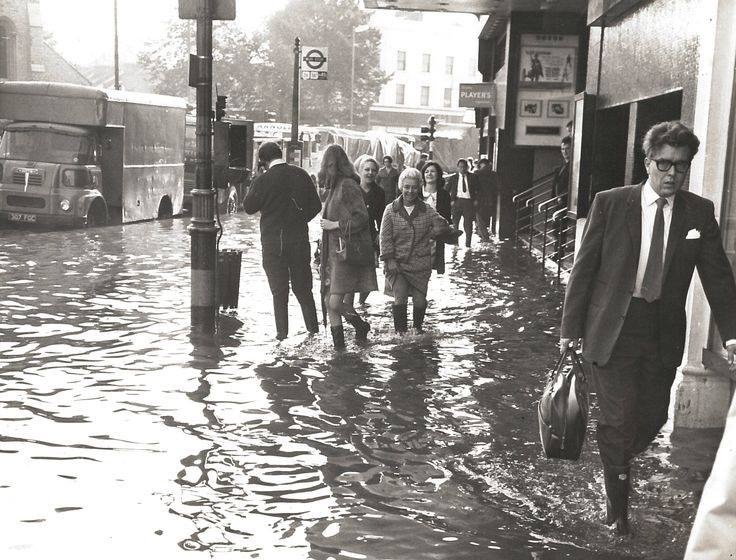 Given the extent of the weather front it wasn’t surprising that the flooding wasn’t an isolated issue for Lewisham, although it was one of the areas that was hit worst; large swathes of south east England were flooded with rail contact between London and Kent was being completely cut. Edenbridge in Kent was completely cut off after the River Eden, a tributary of the Medway, burst its banks. 150 passengers on a diverted train from Charing Cross to Hastings stuck on the train for almost 12 hours at the station there (6). In the days after the flood before the water subsided the army were brought into deliver food to those cut off on upper floors (14). Shops had sales of tinned food without labels which became something of a lucky dip and town centre shops, such as Chiesmans, had flood damage sales. Basements were pumped out – including the Rose of Lee (now Dirty South) and no doubt the shops opposite. The Mayor of Lewisham had used his dinghy to ferry a few people around and investigate what was happening on the ground (lake?) 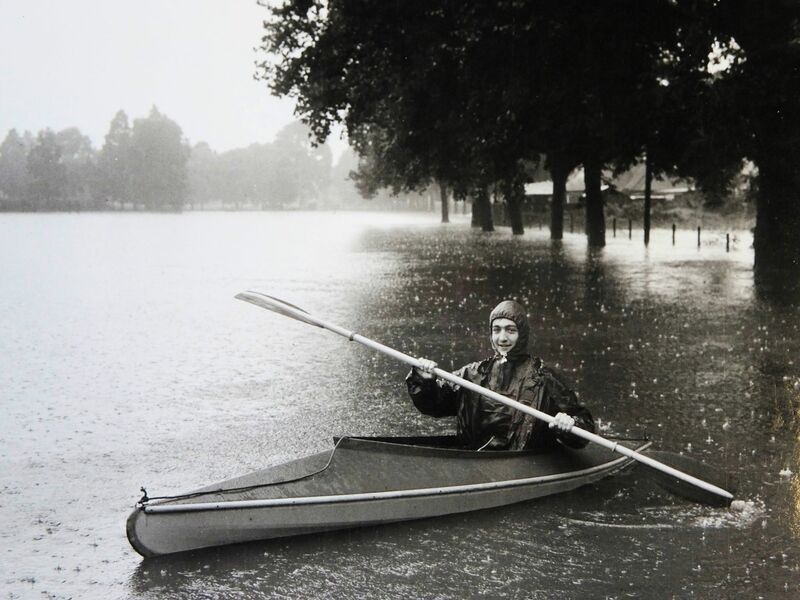 himself whilst the area was flooded (11). However, the then Tory run council was accused of “falling down” on its duties. Some victims were paid up to £1600 from surpluses on funds set up following the Lewisham Rail Crash in 1957 and the Hither Green one of 1967 (12). Some were rehoused by the council, but beyond that, other than giving people a bottle of bleach, there seems to have been little practical support for those families make homeless or having had possessions ruined – particularly those who weren’t insured. After the floods subsided, carpets were hung over fences and other possessions left outside in the hope that they would dry out and recover …..and then there would have been the smell as they probably didn’t properly dry out. Lewisham’s population has changed a lot since 1968, many of the areas alongside the rivers have seen gentrification and those with better paying occupations move in. It is easy to forget the changes in the last 50 years – ‘Employers, Managers and Professional Workers’ made up 34.5% of the adult population in last census in 2011 – in the census immediately after the floods in 1971 only 10.5% fell into this category. Census employment categories have changed a lot over time but it is worth remembering that manual work still dominated in the area at the time of the floods. Household contents insurance was rarer, and then, as now, poorer households didn’t have it. While overall household insurance costs from the floods across south east England were estimated at £15 million (13), this would obviously not have taken into account those without. There was little in the way of a Parliamentary debate about the floods – Parliament was in recess when the floods happened and seems to have moved-on by the time that the floods were debated in mid-October – in the Commons the focus was on farming and in the Lords, oddly on a telephone exchange in Cobham that was flooded for a couple of days. 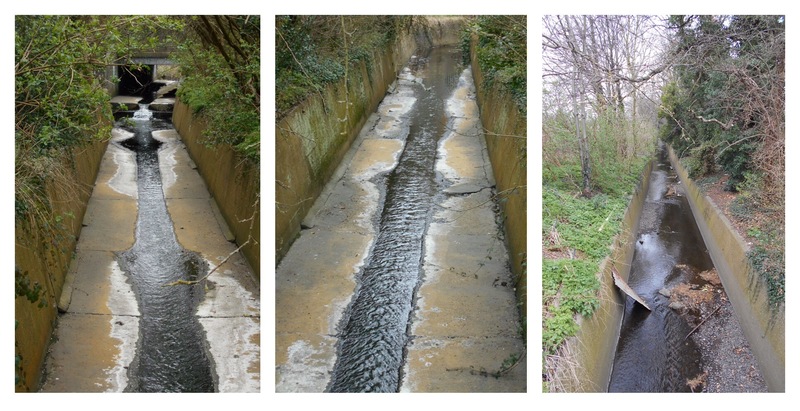 There was little change in approach to moving peak flows downstream, a continuation of plans that had been started on the River Willmore (Boundary Stream) in Penge and other local rivers of creating concrete banks and beds to move water on faster – sometimes referred to as ‘channelisation’. This continued along parts of the Quaggy – notably between Grove Park and Eltham Bridge (see above); the River Pool between Bell Green and Catford had its meanders removed (left) and the concrete casing and straightening continued from its confluence with the Ravensbourne all the way through Catford, Ladywell and Lewisham (see below). There were still occasional more localised flooding’s but the real downside of the concrete straight-jackets was that the lack of natural banks and beds meant that the rivers lost much of the plant and wildlife. New approaches started to be developed from the late 1990s, with large scale flood water storage areas in Sutcliffe Park (above) and Weigall Road which hold peaks flows – much of this happening through work by QWAG, the Environment Agency and other local groups. Similar work is planned in Beckenham Place Park. 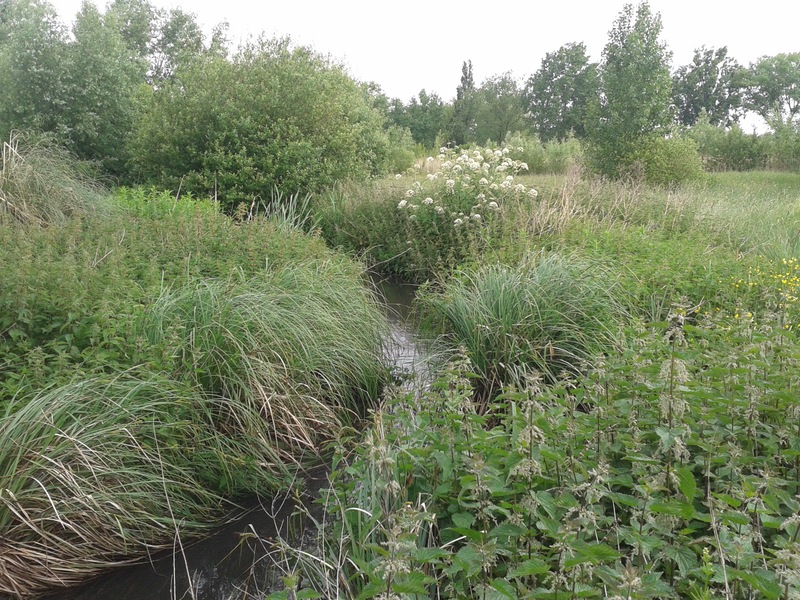 More natural, wider banks and meanders have been added and restored in several areas – notably in John Roan Playing Fields, Chinbrook Meadows, Manor Park and Ladywell Fields (below from late 2013) – these allow the rivers to hold more water in peaks, slow down flows and allow the return of plant and wildlife on banks. The Times (London, England), Monday, Sep 16, 1968; pg. 5; Issue 57357. The Times (London, England), Monday, Sep 23, 1968; pg. 4; Issue 57363. The Times (London, England), Friday, Sep 20, 1968; pg. 21; Issue 57361. The photograph outside the Odeon has appeared numerous times on social media, never credited – if you are the copyright owner do let me know so that I can credit you (or remove if you would prefer. The modern photographs are mine, feel free to use them, credited, for non-commercial purposes. A massive thank you to Emily Hay both for the photos and talking with me about her childhood memories of the floods – it was really helpful and much appreciated. 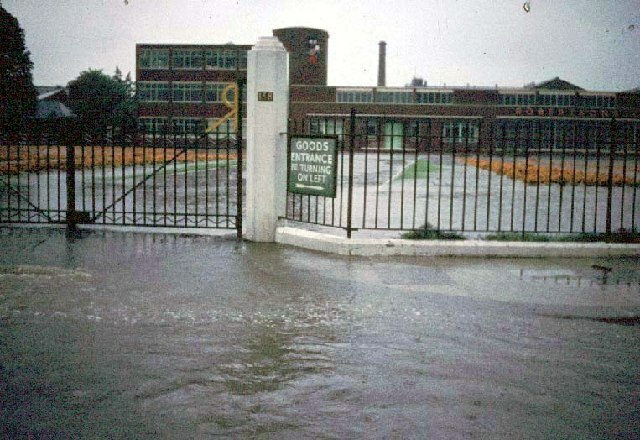 This entry was posted in Lewisham History, Rivers and tagged 1968 Floods, 1968 Lewisham Floods, Lewisham, Quaggy, River Pool, River Ravensbourne on September 13, 2018 by Paul B.